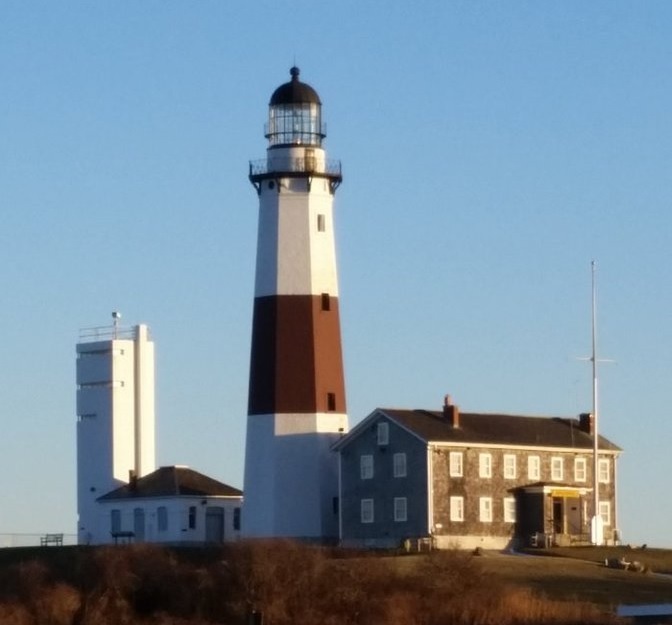 The Montauk Lighthouse is an iconic image of Long Island. Long Island New York is the largest island adjoining the contiguous United States, extending approximately 118 miles east-northeast from the mouth of the Hudson River. It is separated from the mainland on the north by the Long Island Sound and bounded by the Atlantic Ocean on the south and east. Twenty miles at its widest point, Long Island is composed of low plateaus on the north, longitudinal ridges of glacial moraine through the central parts of the island, and gently sloping plains to the south. The East End of the island is made up of two forks. The North Fork is approximately 28 miles long, the southern - terminating at Montauk Point - is about 44 miles in length. Peconic and Gardiners Bays separate the two forks and are where Shelter Island and Gardiners Island are located. Totaling 1,377 square miles of land area, Long Island New York is divided into four counties: Kings (Brooklyn), Queens, Nassau, and Suffolk. Suffolk is the easternmost and by far the largest of the four, covering an expanse of 911 square miles. Following Suffolk is Nassau with 287 square miles, Queens County with 109, and Kings with 70 square miles, the westernmost County. Kings and Queens Counties (Brooklyn and Queens) border each other and fall within the jurisdiction of New York City. Many people in the New York metropolitan area (even those on the island in Queens and Brooklyn) use the term "Long Island" or "the island" to refer to Nassau and Suffolk counties only. 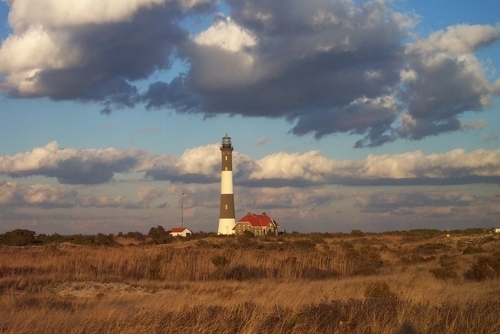 The history of Long Island predates the Revolutionary War. Long Island has a rich cultural history. Native American tribes, including the Lenape (called the Delawares by Europeans) have inhabited the island for thousands of years, and while their populations have mostly been replaced with the descendants of immigrants from across the world, two reservations uphold this legacy on Long Island. The Shinnecock and Poospatuck reservations, now federally protected, are the homes of these tribes, and each year visitors are welcome to the Shinnecock reservation to learn about and participate in the seasonal festivals. Early colonial figures included Wyandanch, Captain Kidd, Lionel Gardner, and John Underhill. The West of Long Island was settled by the Dutch, and the East settled by Puritans from Massachusetts. Long Island was the scene of several witch hunts, including one involving Lionel Gardner in Easthampton. The English and Dutch were the first European settlers on Long Island, but came under English rule in 1664 when the entirety of the Dutch colony of New Amsterdam was brought under English rule. From that time Native American populations began to decline as the population of European settlers grew. The largest battle of the Revolutionary War, the Battle of Long Island, was a major loss for General George Washington. Since it remained under British control throughout the war, Long Island became one of General Washington’s most strategic areas for espionage. Long Island’s beautiful north shore attracted both wealthy Americans and Europeans during the Gilded Age whose large and lavish estates earned this region the title of “The Gold Coast.” Today these estates have been reborn as gold courses, parks, subdivisions and museums, and while the former wealth that once inhabited the area is gone, the tradition of fine homes and wealthy landowners is still alive along the north shore. Long Island remained largely rural and agricultural throughout the 19th century. Nassau County experienced the largest growth in the United States between 1950 and 1970, setting off a chain reaction of suburbanization and economic development across Long Island. Today Nassau and Suffolk Counties are ranked among the most expensive areas to live in the United States, and are home to some of the nations best public and private schools and most effective community offices. "Nassau" is one of several names by which the island was once known. Long Island was the home of several prominent Roosevelts such as author Robert Roosevelt, and the summer home of his nephew Theodore Roosevelt. In 1996, tragedy struck Long Island, as TWA Flight 800 exploded over East Moriches. 230 people were killed in the disaster. Also, September 11th 2001 had a major affect on Long Island. Due to the proximity of New York City to Long Island, many victims lived outside of the city on Long Island in the suburbs and commuted to the trade center each day via train or subway (if in the city). So, Long Island lost many loved ones in the towers and were affected economically as well. To the north of the island is Long Island Sound, which separates it from the coast of Connecticut and Rhode Island. To the south are the Great South Bay, South Oyster Bay, and Jamaica Bay, which are actually lagoons, protected from the Atlantic Ocean by a string of narrow barrier islands, most notably Fire Island. The island separates into two forks at the eastern end, known as the North Fork and South Fork. Long Island is interesting because it is geographically part of the Mid-Atlantic, however many towns and hamlets along the island's north shore and in eastern Suffolk County, such as Oyster Bay, Port Jefferson and Sag Harbor seem to resemble New England towns, while many of the towns and hamlets along the south shore, such as Long Beach, Valley Stream, and Babylon seem to resemble Mid-Atlantic coastal communities, especially those on the shore between New Jersey and Virginia. Long Island can be considered the geographical border between the Mid-Atlantic and New England. The island's tallest point is Jayne's Hill near Melville, with an elevation of 400.9 feet (122.2 m) above sea level. The island is separated from the mainland by the East River - actually not a river but both a tidal strait and a tidal estuary. Long Island is comprised of counties, two cities (Long Beach and Glen Cove), numerous local towns, townships, villages, hamlets and designated places. Long Island is one of the most densely populated regions in the United States. In the 2004 census, the population of the Nassau-Suffolk region totalled 2.8 million people. While there is more diversity than in most suburban areas of the United States, Italians, Irish, and Jews make up a major portion of the local population. Long Island has a climate that is very similar to other coastal areas of the Northeastern United States; it has warm, humid summers and cold winters, but the Atlantic Ocean helps bring afternoon sea breezes that temper the heat in the warmer months and limit the frequency and severity of thunderstorms. In the wintertime, temperatures are warmer than areas further inland (especially in the night and early morning hours), sometimes causing a snowstorm further inland to fall as rain on the island. However, measurable snow falls every winter, and in many winters one or more intense storms called nor'easters produce blizzard conditions with snowfalls of 1-2 feet and near-hurricane force winds. Temperatures in Nassau and Suffolk are similar. The winter average for Nassau is 33.7 degrees Fahrenheit, compared to a summer average of 72.7 degrees. In Suffolk, the winter average is 32.4 and summer average is 71.9 degrees. The Nassau area receives about 45 inches of rain, compared to 42 inches for Suffolk. Snow falls at about 26.9 inches per year in Nassau and 30 inches for Suffolk. The counties of Nassau and Suffolk have long been renowned for their affluence. With the median price of houses at $500,000 USD, Long Island has a very high standard of living rate with residents paying some of the highest property taxes in the country. Long Island has approximately 2,400 real estate offices and some 27,000 real estate agents. It is home to some of the most expensive houses in the country with a recent property making the headlines at $60 million dollars. The economy of Long Island has long benefitted from its proximity to New York City, although after World War II, Long Island began developing industry of its own. From 1950-1980, Long Island was considered one of the aviation centers of the United States with companies such as Grumman making its headquarters in the area. In recent decades companies such as Computer Associates, with its headquarters in Islandia, have made Long Island a center for the computer industry. Nevertheless, the eastern end of the island is still partly agricultural, now including many vineyards as well as traditional truck farming. Fishing also continues to be an industry, at Northport and Montauk. Since World War II, however, Long Island has become increasingly suburban and, in some areas, fully urbanized. Levittown was only the first of many new suburbs, and businesses followed residential development eastward. The South Fork contains the area known as the Hamptons, which also experienced a population boom after World War II. Nassau County and Suffolk County are each governed by legislatures. Nassau has 19 equal-sized districts, while Suffolk is divided into 18 legislative districts. In addition to two cities and three towns, Nassau County also contains 64 villages with their own elected officials, including a mayor and a village board. Suffolk County is divided into 10 towns. Each town elects a supervisor who is its chief executive officer and presides over town boards. Other elected officials are the town clerk, superintendent of highways and receiver of taxes. There are also 31 villages and 128 hamlets in Suffolk. In terms of police officers, Nassau County's eight precincts have 2,981, slightly more than Suffolk with seven police precincts and 2,748 officers. Long Island is largely served by volunteer firefighters. Politically, Long Island was long controlled by the Republican Party. Republican presidential candidates won both Nassau and Suffolk counties from 1900 until 1988, with the exception of the 1912 victory of Woodrow Wilson and the Lyndon Johnson landslide of 1964. In 1972, Richard Nixon won Nassau, Suffolk and Queens and came within 14,000 votes of winning heavily Democratic Brooklyn. In 1992, the counties split with Nassau voting Democratic and Suffolk voting Republican; however, since 1996, both counties have been Democratic, although by fairly close margins. In 2004, John Kerry won Suffolk County by just under 14,000 votes. In 2000, Senator Hillary Clinton lost both Nassau and Suffolk to Republican Rick Lazio who had previously served as a congressman from Suffolk County. In 2001, Nassau County elected Democrat Thomas Suozzi as county executive and Democrats took control of the county legislature, marking the first time Democrats had full control over county governments. Republicans still held on to the District Attorney's office and Hempstead town government, which has not had a Democratic majority on the town council or held the town supervisor position in close to 100 years. In 2003, Suffolk County followed suit, elected Democrat Steve Levy as county executive, however, the county legislature still remains in Republican hands. According to the National Census Bureau of Statistics, Long Island is considered the "safest place to live" per capita in the United States. The island is patrolled by The Nassau County Police Department (reportedly the second highest paid police force in the country), the Suffolk County Police Department (the highest paid), The New York State Troopers, and several dozen town and village police departments. Both counties also have a sheriff's office which handles civil process, domestic violence, as well as running the county jails. Suffolk County Sheriff's deputies have full police officer powers and a patrol divsion which mainly operates in the Eastern part of the county. Nassau and New York City deputies are peace officers and have no patrol function. The preferred mode of travel around Long Island is the automobile. Long Island traffic, especially during rush hour, is a hot topic of discussion and often referenced in comedy routines with an average of 3.4 cars per household. Traveling by road, Long Islanders use three main arteries into New York City: The Long Island Expressway, the Northern State Parkway and the Southern State Parkway. By train, the Long Island Rail Road (LIRR) is the busiest commuter railroad in North America, carrying an average of 274,000 customers each weekday on 730 daily trains. Chartered on April 24, 1834, it is also the oldest railroad still operating under its original name. Throughout that time, the LIRR has been an essential component of the region's transportation infrastructure, leading to the development of the Long Island communities it serves and providing a gateway to the economic growth of the region. By sea, there are several Long Island Ferries that run from Fire Island to Shelter Island, one to Block Island, four to Connecticut. Ferries are also available for charter. Two major international airports, John F. Kennedy and La Guardia, are located on Long Island in Queens County, with several other smaller private and public airports throughout Nassau and Suffolk Counties, including MacArthur Airport in the Town of Islip. Being an island, Long Island also offers several ferry lines for commuters and tourists alike, connecting Long Island, New York City, Fire Island, Staten Island, Block Island, Shelter Island and Connecticut. The Long Island Rail Road is a favored method of transportation on Long Island, with line branches running along the north and south shores, as well as a main line running centrally east and west across the island. Nassau and Suffolk Counties operate their own public transit busses, further expanding the network of public transportation on Long Island, and making the transition to city transportation quite simple for commuters. Long Island is home to 127 public schools districts, 416,093 students and 29,901 teachers. There are also 233 private schools, with 53,629 students and 4,873 teachers. The area is also comprised of 17 four-year colleges, eight two-to-three year colleges and five professional institutions. About 88.4 percent of high school students on Long Island go on to enter post-secondary education. The Nassau County library system services 54 libraries and four branches. The Suffolk Cooperative Library System includes 54 libraries and seven branches. Long Island is full of natural beauty. One of the most popular summer destinations on Long Island, especially for the city's well-to-do, is the Hamptons in eastern Long Island's Suffolk County. Montauk, NY (the end) is a tourist destination and a hot spot during peak fishing seasons. Also, Fire Island National Seashore which is a long barrier island on Long Island's south shore is a hot spot for tourists, especially during the summer. Fire Island's prestigious beaches attract many. Ocean Beach is the most populous town on Fire Island. The island is only accessible through ferries from Bay Shore, Patchogue/Bellport, and Blue Point. Both Nassau and Suffolk County enjoy the many restaurants owned and operated by skilled chefs that rival their counterparts in New York City. Pizzerias are highly ubiquitous with at least one or more pizzerias located in each town. Long Islanders take their pizza seriously with the Best Pizza on Long Island Contest and Festival an annual event held in October during National Pizza Month. Other regional eateries are very prevalent in most Long Island towns. Most every town in Nassau County has at least one diner, most of them operating 24/7, where people can meet and eat. Most were established during the 70's, and specialize in hamburgers and sandwiches. Long Island is home to several hundred hotels, motels, and bed and breakfast inns. Most of the b & b inns can be found out east especially concentrated on the North Fork in the area referred to as Long Island Wine Country. Several new hotels are also planned for development to support the thriving travel and tourism industry on the Island. The Long Island Convention & Visitors Bureau and Sports Commission was formed in 1978 as a non-profit membership corporation under the laws of New York State. Its purpose includes the promotion of the Nassau and Suffolk County region as a destination for visitors, meetings, conventions, trade expositions and sporting events. Nassau County is home to the New York Islanders of the National Hockey League, who play at the Nassau Coliseum in Uniondale. Belmont Park, whose main track is the longest dirt thoroughbred racecourse in the world, is located in the Nassau County community of Elmont. Long Island is also home to the minor league Long Island Ducks baseball team of the Atlantic League. Their stadium, Citibank Stadium, is located in Central Islip, New York. It also has a professional soccer club, the Long Island Rough Riders, who play at Mitchel Athletic Complex in Uniondale. The Rough Riders have won two national championships in 1995 and 2002. LongIsland.com is a free news and information directory for the Long Island, NY area. Established in 1996, the Web site began as a simple list of Long Island Towns and evolved into Long Island's Most Popular Web Site for Long Island New York. The LongIsland.com online community is a free resource featuring local news, classifieds, press releases, restaurants, business, hotel directory, real estate, museums, parks, beaches, chat, bulletin boards, a huge calendar of events and advertising. Sign up for our FREE weekly eNewsletter to stay informed of what is happening on Long Island. Can't find it? Post any Long Island related questions to our Advice/FAQ section, and get all the answers you're looking for. This information was compiled from a variety of sources including government census data, Nielson reports, LongIsland.com user surveys, Wikipedia.com and the Long Island Power Authority - LIPA. Feel free to send us your feedback if this page needs updates or corrections. Content Use: This information is provided for private, non-commercial use. Please cite LongIsland.com and provide a link to this page as the reference source if you wish to reproduce this information for anything other than private use, that includes book reports as well as homework assignments!